10 amazing origami dragons for you to enjoy! This is just a list, not a ‘top ten,’ because I just don’t think it would be fair to rank them – they are all amazing! Which are your favourites? The names I have used are those given them by the artists. This amazing origami dragon is by Joseph Wu whose work I have featured before. 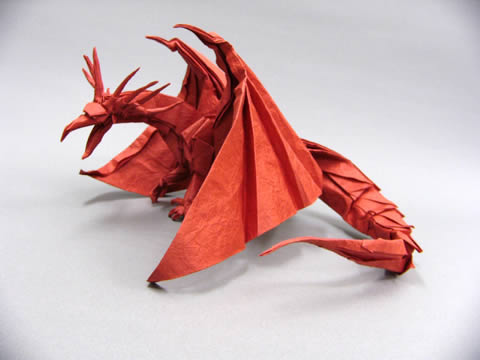 It is called the Grand Dragon and is made out of six pieces of folded paper which is apparently dark orange – not red! 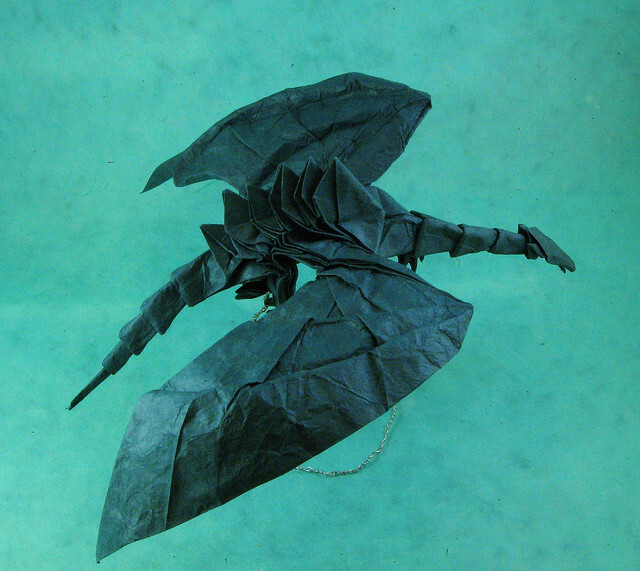 This is Bahamut out of Final Fantasy VII by Satoshi Kamiya. 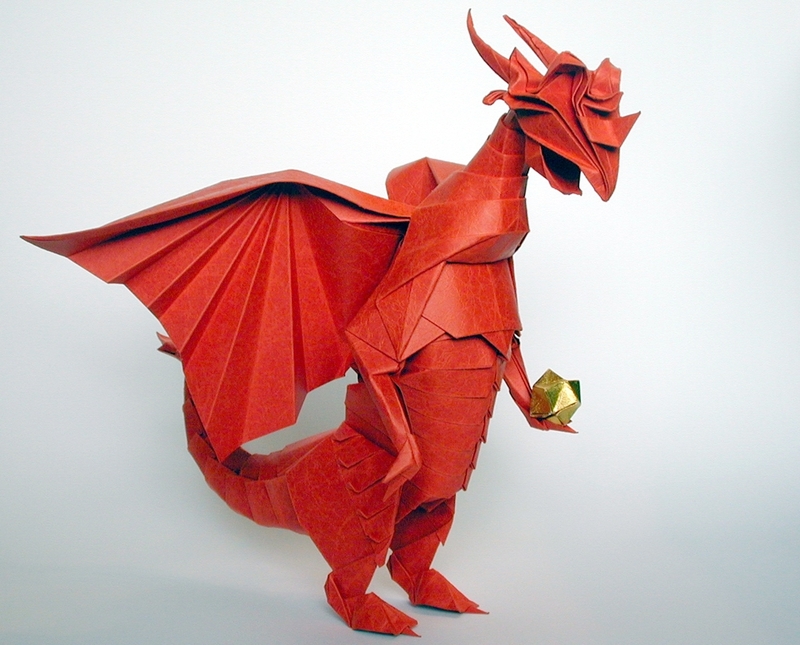 It looks exactly like Bahamut out of the computer game and amazingly is made from a single sheet of paper (i.e. it is ‘true’ origami). (Here’s a link to Satoshi Kaniya’s personal website but it is in Japanese). 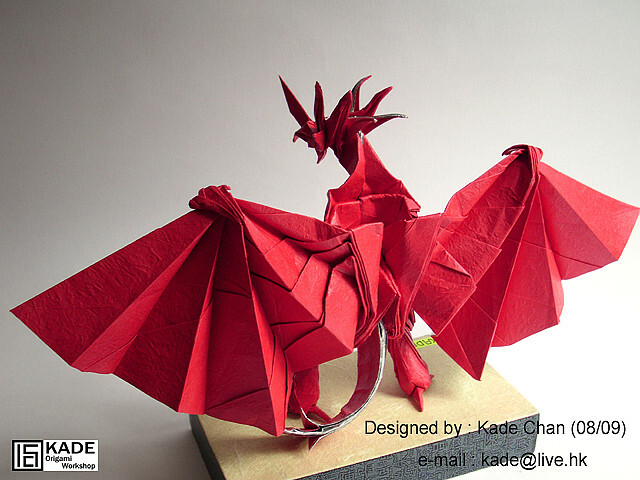 The Origami Dragon Kaiser is a tough-looking red dragon by Kade Chan and folded from a single piece of paper. You can see the front here and boy does he look mean! The inside of his wings have had foil added. 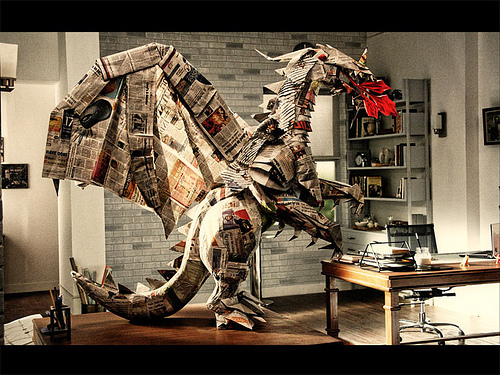 A large, man-sized fire-breathing dragon folded from newspapers (and lots of the I reckon) by Himanshu Agrawal. Maybe we’re getting furthur away from Origami and more into the realm of paper-sculpting, but I don’t care. IT’S SO AWESOME! 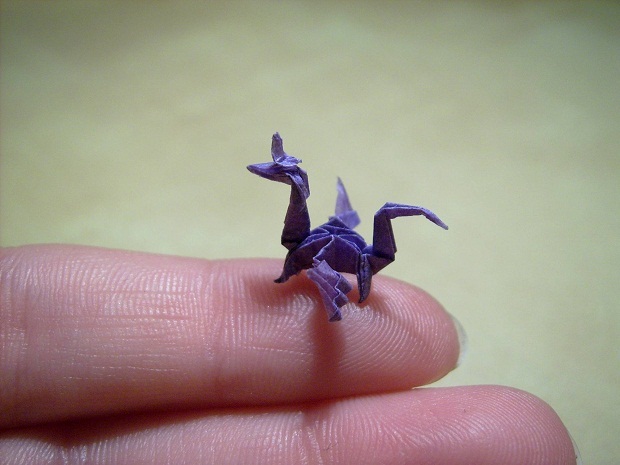 This teensy tiny dragon was made by Anja Markiewicz – and it’s not even the smallest!! She credits the pattern for the dragon to Robert Lang. Made from one – very small – piece of paper. 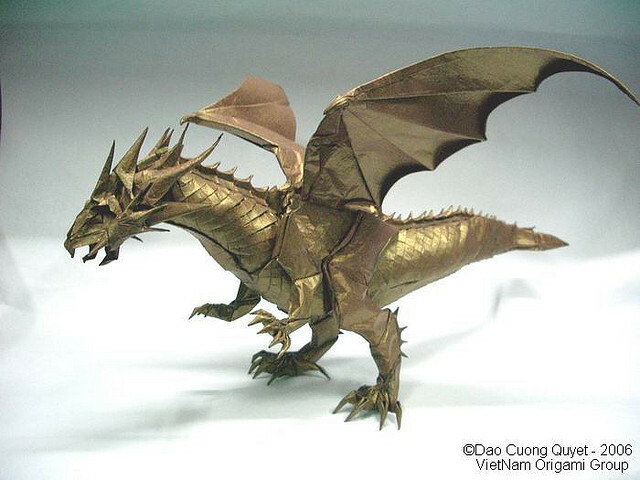 This gold origami dragon was made using 21 sheets of paper by Dao Cuong Quyet. I think the crispness and the details are amazing, especially the scales. Part of the Vietnam Origami Group. 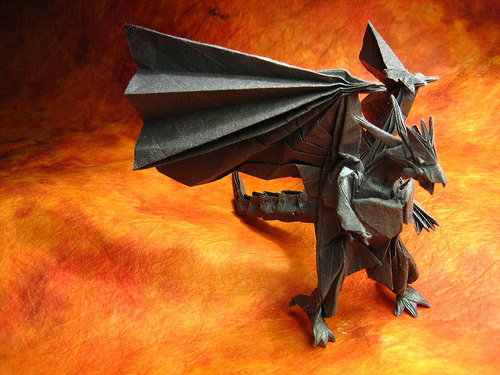 Another origami dragon by Satoshi Kamiya – the very complicated Ancient Dragon. This pattern requires around 275 steps and needs to be made from a min. 20″ square of thin paper. This origami dragon is by Jon Tucker and folded from a 17″ square of Lokta paper. Amongst the dragon patterns we have here it is the only one with a decent wing span! This dragon could believably take flight. 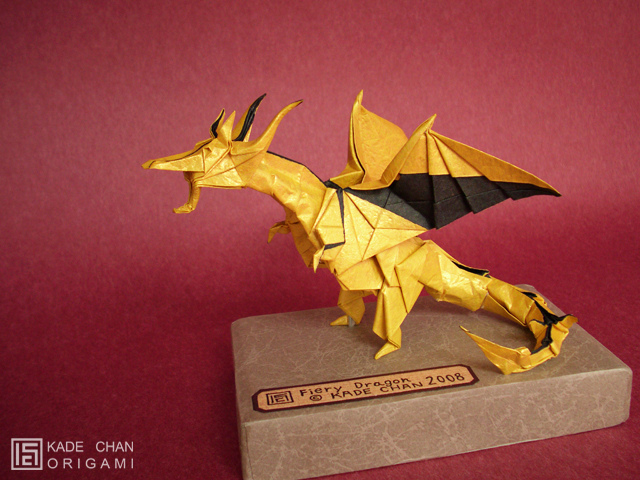 Another origami dragon design by Kade Chan. The Fiery Dragon is made from one sheet of 30sq.cm paper, in this case with a second piece of tissue paper used to achieve the two-tone effect. Alright so this isn’t really an origami dragon at all, it’s the 2010 La Cañada Flintridge Rose Parade float, but it’s still really cool! 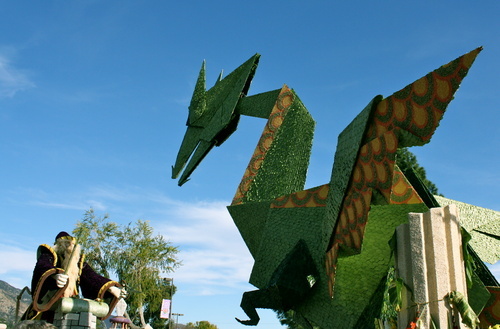 The gigantic green origami-style dragon faces a wizard wielding a wand and a pair of scissors! What else to keep a paper dragon at bay? Both the dragon and the wizard were mechanised move. The dragon lunges towards the wizard then rears back and flaps it’s wings as the wizard threatens it with his scissors and wand. It won the Fantasy Award for best display of fantasy and imagination. The animation is really spectacular as shown in the video below. And that’s all for now folks! I may create another list of amazing origami dragons in future, focusing more on oriental-style dragons.